Galeria de Rescator Resort 116. The apartment in Rosas / Roses has 1 bedroom (s) and capacity for 4 people. Comfortable apartment of 45 m² and very luminous. It is located 1200 m from the bus station, 1300 m from the supermarket, 1500 m from the city, 1900 m from the sandy beach and is located in a quiet neighborhood in the mountain. Facilities include a safe box, swimming pool, television. 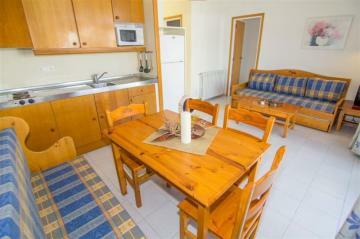 The kitchen is equipped with fridge, microwave, crockery / cutlery, cookware / kitchen, coffee maker.